Welcome to our review of the TRUGLO 4×32 Crossbow Scope in matte black. If you’ve reached the point where it’s time to upgrade from the scope bundled with your crossbow, or if you’ve been using a scopeless crossbow, this one might catch your eye with its great price. Let’s check it out and see if it’s competitive against other crossbow scopes. 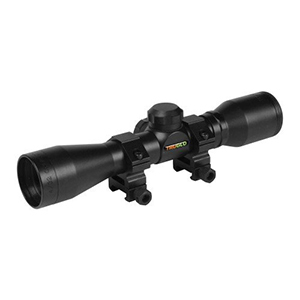 This scope has a 32mm objective lens, and provides you with a comfortable four inches of eye relief. The tube is the standard one-inch diameter, and the scope is eight inches long. It’s constructed from aircraft grade aluminum, and the scope comes with a pair of one-inch rings for mounting to your crossbow. How Much Magnification Do I Get From the TRUGLO 4×32 Scope? A pretty standard x-bow scope, the TRUGLO offers 4X magnification with a very clear picture of your target and beyond, all with a special range-finding and trajectory compensating reticle. The image has plenty of contrast and resolution, and I’ve found it easy to get a bead on the vitals of a deer from as far away as 75 yards. TRUGLO has fully coated the optics on the scope, providing excellent brightness, clarity, and contrast through the full color spectrum. The reticle is deer-sized, making it easy to determine your range. Four horizontal lines provide you with trajectory compensation at various ranges, allowing you to shoot with confidence even beyond the normal 20 yards you might sight in at. Unfortunately, the scope does not provide any way to adjust for different velocities, so you will have to manually discover the range for each line through trial and error. This particular scope is not illuminated, but it does feature decent light transmission. While it’s not perfect for low-light situations, I have used this scope several times during dusk and dawn hours, and been able to confidently take a shot and fill my tags. With my TenPoint Titan crossbow, after taking the time to properly sight in and determine the range for each line of the reticle, I was actually able to take down a 12-point buck just a few minutes after dawn. It’s just too bad the scope doesn’t have illuminated reticles, but a different model of the same scope offers red/green illumination. The TRUGLO 4×32 scope provides you with a field of view that’s 24 feet at 100 yards, which is pretty adequate for deer hunting purposes. You can quite easily lead a deer from 100 yards, but of course that’s just a pipe dream with a crossbow. Closer targets have a narrower field of view, but the distance from a 50 foot range is still more than adequate for tracking a deer on the move. You get a pair of 1-inch rings that match the finish of the scope, so you have everything you need to get started right away. Some folks have reported that the rings didn’t fit their crossbow rails, but I suspect that’s because their x-bows had dovetail mounts instead of the more standard Weaver/Picatinny rail. I had no problem with any of my own crossbows (TenPoint, Barnett, and Horton x-bows), and was able to mount the scope in under five minutes. If you follow our advice on mounting a crossbow scope, you’ll be up and running in no time. How Easy is This Scope to Sight In? All third-party scopes require some fine-tuning to zero in on the target, but the TRUGLO is easier than most. Follow our advice on sighting in your scope, and the whole process will be relatively painless. The fintertip adjustable windage and elevation knobs are quite easy to use, and the durable leaf springs TRUGLO has equipped them with help the scope to hold zero throughout several seasons. The most difficult part of setting this scope out isn’t really difficult, but time-consuming: checking the different reticle lines at various ranges to accurately shoot beyond 20 yards. Made from aircraft grade aluminum, this scope is quite rugged. It is also O-ring sealed and nitrogen-purged, so the scope is both waterproof and fogproof. I’ve had this set up on my TenPoint Titan for several years, and I’ve dropped it accidentally from my tree stand a couple of times without any problems. Thanks for checking out this scope review. The TRUGLO 4x323mm crossbow scope is an excellent value, and should provide you with several years of hunting accuracy on your crossbow. The best feature, to me, is the range-finding reticle, which makes this stand out from a crowd of competitors at its price range.